An easy to miss footnote in Tesla Motors' fiscal year 2012 SEC filing (10-K) reveals the launch of the Tesla Model X will be delayed until late 2014. The Model X is the successor to the Model S, and will be an all electric SUV with the destined-to-be-iconic falcon-wing doors and performance matching a Porsche sports car. 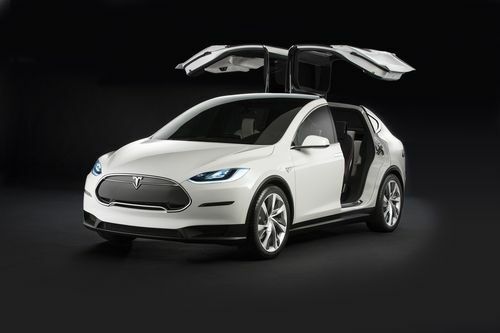 The "alpha" prototype of the Model X was unveiled in Feb. 2012 (see Tesla reveals the Model X, an all-electric SUV that's faster than a Porsche 911), and an updated version was updated at the North American International Auto Show (NAIAS) in Detroit, Jan. 2013. The focus of the Model X is those who need a larger car than the Model S. For example a family with five kids (Elon Musk has five children) has a certain need to carry people and stuff, giving us one reason why SUV's are popular. It being designed by Tesla the Model X will come in a performance version that is promised to have a faster 0-60 miles/hr time than a Porsche 911 sports car. This will be something the automotive public has never seen before, a vehicle with the functionality of a minivan but the performance of a sports car. In Feb. 2012 the company said they expect to enter limited Model X production in 2013 with full production beginning in 2014. That might have fit the pattern of the Model S launch, where limited production and deliveries began in June 2012 with a slow production ramp-up until December 2012 when the factory hit full production. However their fiscal year 2012 10-K filing for the SEC had this to say: "We are adapting the platform architecture of the Model S to develop our Model X crossover. We revealed a prototype of Model X in February 2012 and plan to begin production in late 2014. This unique vehicle has been designed to fill the niche between the roominess of a minivan and the style of an SUV, while having high performance features such as a dual motor all-wheel drive system." In other words, the timeline is a little different now. This statement doesn't make it clear whether "begin production" means full production of the Model X, or limited production. It does make it clear that Model X production will be delayed by at least a year over original expectations. That's likely to make Model X reservation holders unhappy. These plans could well have been affected by the Model S production delay which resulted in manufacturing only 3,100 Model S's by the end of 2012 instead of the projected 5,000 units. Tesla's management describe the delay as difficulty in lining up parts from suppliers. The 10-K filing says several different ways that the company has "limited experience to date in high volume manufacturing of our electric vehicles" and essentially that the company's manufacturing arm is learning their way towards being a full fledged automobile manufacturer. This is listed as one of the many risk factors surrounding Tesla Motors. The delay raises three forms of risk. First, the other automakers will have a wider window of opportunity to design competing vehicles. Second, the customers may get tired of waiting. Third, it's not just the Model X that would be affected by a delay, but the third generation line of Tesla's cars. That vehicle is the one in which Tesla intends to bring the price point down for mass market sales, and be Tesla's first serious departure from high priced luxury cars. It is meant to go into production following the Model X, but the delay could give competing automakers more time to solidify the electric car market for themselves before this third generation Tesla can hit the market. I've never seen better Tesla coverage than yours. Saw this here first. they are right on track, their stock is very good and it has already paid for my model C that they will make 2 about 2 years. quote= In Feb. 2012 the company said they expect to enter limited Model X production in 2013 with full production beginning in 2014.